Randall O’Toole has never met a transit project he didn’t hate. The Cato fellow has a knack for inserting himself into nearly every local debate over transit expansion, arguing against investments in rail and bus service. He’s done it in Albuquerque. And Atlanta. And Charlotte. It’s almost impressive, except O’Toole’s shtick isn’t hard to pull off when local media outlets are such easy marks. He slots right into their “two sides to every story” style of coverage, no matter how shallow, formulaic, or demonstrably wrong his analysis might be. O’Toole is currently parachuting into Nashville, which will vote on a $5.2 billion transit expansion plan in May. He has a willing partner in the influential Nashville Business Journal, which treated an O’Toole anti-light-rail screed in the Wall Street Journal as a news event, rather than another rote performance of his well-worn routine. As Nashville gears up for the vote, the Business Journal has been trotting out O’Toole as well as the Manhattan Institute’s Aaron Renn and Vanderbilt professor Malcolm Getz to round out its slate of opponents to Mayor Megan Barry’s plan. Real watchdogs distinguish between white elephant transit projects that won’t move many people and good transit investments that will address real travel needs in cities. O’Toole only has one setting: oppose the project that’s on the table. TransitCenter isn’t shy about calling out bad transit projects. Orcutt, for example, has been an outspoken critic of New York City Mayor Bill de Blasio’s plans for a streetcar along the Brooklyn-Queens waterfront. But in Nashville, he thinks the city has developed a very solid plan. “I think that they’re reading it right, that now’s the right time to change things,” he said, noting that the city has very little in the way of frequent transit service. The local transit system only carries about 30,000 trips a day, well below peer cities in the Sunbelt. “The technical dimensions” of the Nashville plan “are great too,” he added. Barry’s proposal calls for five light rail lines totaling 26 miles, 25 miles of bus rapid transit, a 1.8-mile transit tunnel to bypass downtown congestion, and systemwide bus improvements. “A lot of times you see mayors go, ‘Oh, shiny! I want rail,’ without realizing there’s some difficult dimensions to it,” said Orcutt. Take Denver, which has built an extensive rail system that caters more to unwalkable suburbs than city neighborhoods where transit works best. Or Detroit, one of several American cities which has built short mixed-traffic streetcar segments that serve a downtown niche, and not very well. Nashville isn’t taking those shortcuts. Barry’s plan has several things going for it, Orcutt says. For one, it doesn’t skimp on the basics of a good bus network. The first phase focuses on adding bus service over a three-year timetable to build up transit ridership. The full plan calls for buses to arrive at least every 15 minutes on the busiest routes. Nashville is also paying attention to how it will make streets more walkable, so people can get to their transit stop comfortably. Barry has said she will create a stand-alone department of transportation and empower it to improve walking and biking infrastructure, with a focus on safety. And the plan avoids political compromises that have weakened rail expansions in cities like Seattle and Los Angeles, which cater to distant suburbs. The Nashville plan is squarely about improving service in the city, where the need for good transit is greatest. “Very few places put all that together,” Orcutt said. Take Denver, which has built an extensive rail system that caters more to unwalkable suburbs than city neighborhoods where transit works best. Fair criticism but the system is ‘regional’ and it’s what the voters wanted. As a visionary system it is intended to direct future TOD for the metro area. It took Miami 30 years but their commuter rail is now indispensable. Those who demand immediate gratification are not always the wisest. Stay tuned. BTW, that system nearing completion was built for $58 million per mile. Compare that to any other light rail project you wish and get back to me. If it wasn’t O’Toole then it would be somebody else. BTW the response to O’Toole in the MBJ was very good so it’s not as though they were catering strictly to the naysayers. Convincing the voters to spend money is never easy but even average Joe’s often have good instincts about what is best for their own community. Aha, Angie has caught on to what passes for news. Stories are based on press releases from flacks based on “studies” by interest groups. To be “fair and balanced” the MSM rounds up one of the usual suspects for a shallow quote in opposition. And that’s it. I guess we get what we pay for. I used to be that a journalist would cover a beat for decades, and by the end of it be as much or more of an expert as the people they were covering. Not any more. I wonder what happened to Aaron Renn. I used to know the guy a little bit IRL when he lived in Chicago and he wasn’t a conservative anti-transit crusader. Lately? Seems like a different guy. As long as car companies and oil companies continue to be the biggest sources of advertising revenue for media outlets, they will continue to give space to anti-transit snake-oil salesmen like Randal O`Toole. Interesting that a Streetsblog writer would oppose balance and objectivity in their “journalism”, and instead only want to present one side of the argument. The reality is that there are always two sides to every story, but some sources don’t like that idea, and prefer bias. What Angie is trying to say is that Randall O’Toole is much like the guy CNN always put on to argue against global warming – while there are 97 scientists with verifiable proof that global warming is real, there are 3 people who claim there isn’t. For the sake of “balance”, you have one person arguing each side, but a balanced argument would have 97-to-3. Yeah, it’s been a long downward slide for him since the Urbanophile days. He seemed to have a conservative “awakening” around Trump’s rise and started to make a hard turn towards the right in his opinions. Back when he was becoming known his writing had an element of fiscal conservatism and general prudence to it, but he took it much further. Yeah, Aaron Renn lost it at some point. He always had a bizarre bias *against* cities (weird for an “Urbanophile”) while promoting unwalkable transportation deserts like Indianapolis, but after a while he *completely* lost it. There are other professional anti-rail hacks, but these two do *nothing else* but being anti-rail hacks. O’Toole is just a paid hack. He’s paid to attack rail, and he will lie to do so. Renn and Getz are armchair “experts”. As another armchair expert, albeit with far more experience and knowledge than Renn, I can state authoritatively that Nashville’s plan is a very good one — one of the best plans I’ve ever seen in the US. I prefer to refer to those that practice “press release journalism” as paid stenographers. Randall O’Toole has degrees in Forestry Science and Geology, not exactly the cv of someone to be an expert in urban planning. Whether you believe this means he can’t see the forest for the trees or has rocks in his head is up to you. @Folicle – Boy, have you got it wrong. Balance and objectivity are fine, but the “two sides” framing is not that. At all. That framing is so easily hijacked by those with no integrity, the strategy being to concoct a “side” very far away from the truth so that people who fall for the “two sides to every story” thing will triangulate way from the truth. The “two sides” framing makes sense when it’s applied to two people of equal value and power, that’s why it’s so compelling. But it fails miserably when one side has far more power and no compunction about lying. O’Toole has no compunction about lying and he is in the pay of the very powerful. The real reality is that there are more than two sides to every story; you have to look and think harder than that. O’Toole knows exactly what his paymasters in the gasoline industry want him to say, and he says it. (And yes, he is paid by the gasoline industry — the bogus “foundations” he gets money from and gets published by are basically funded by Big Oil.) However, I suspect that he also believes the nonsense he pushes, because he’s a total fanatic ideologue. Rail costs too much does too little and benefits too few. Costly Rail is about land development not mobility. Rail TOD is often subsidized and causes gentrification hurting low income. Costly Rail benefits special interests and often cannibalizes bus service that the transit dependent need. Costly rail is known for huge cost overruns and often what is promised is never delivered. Costly rail is antiquated 19th century technology that innovation and new technology are making irrelevant. 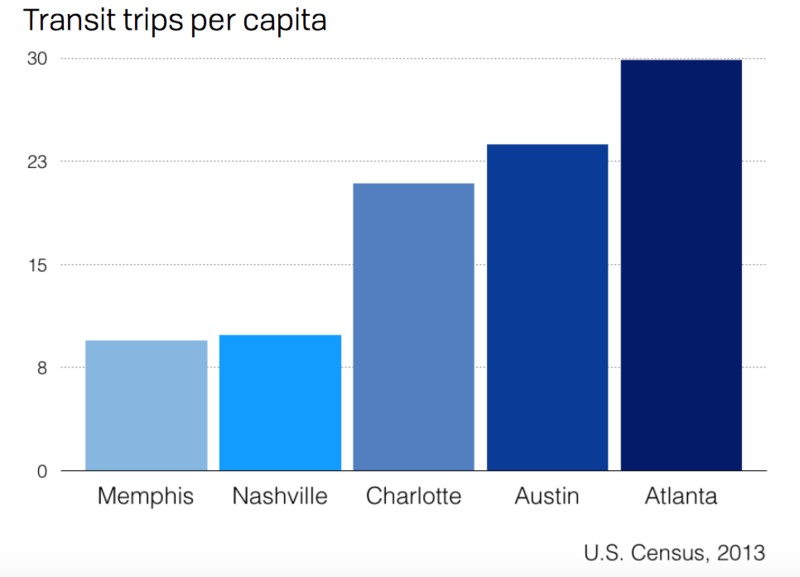 Transit ridership continues declining in Nashville so why would taxpayers want to raise their taxes to spend BILLIONS on more failure? Wow, lobbyists? Who knew? Does this sort of thing still happen? It’s so unfair when they’re not on our side. Perhaps we can put a halt to it like we’re trying to do with free speech and dissenting thought. What i dont understand is why would Oil Company who have more money then God lobby against buses? I’ve never understood this “19th century” complaint. New is not automatically better, and the invention of the car—in the 19th century—is closer to the invention of the train than it is to the present. Why Are State Senators Holding Up Indianapolis’s Transit Plans? Nashville planners have put together a $6 billion transit expansion plan that calls for four light rail lines, three bus rapid transit routes, a commuter rail connection, and more. And it looks like a referendum on raising local taxes to pay for the package would fare well, according to a new poll.